What every person with diabetes should know about lipohypetrophy. Lipohypertrophy (LH) is a medical term for abnormal fat growth. Most often it is used to describe the fat changes associated with insulin use. Interestingly, although LH has always been a major complication of subcutaneous insulin administration, most individuals with diabetes remain unaware of its existence. It is our goal at Freed DM to change this lack of knowledge. 1) Up to 64% of individuals with diabetes may be affected by lipohypertrophy . 2) Lipohypertrophy worsens glycemic control . Imagine if 64% of people with diabetes could lower their hemoglobin A1C just by moving their insulin injection or infusion set sites by a few inches. Imagine if we could decrease the rate of complications by just one percent. Think of all the individuals we could save from blindness, heart attacks, kidney failure, limb amputation, strokes, and early loss of life. This article will explain lipohypertrophy, how to prevent it, and how to reverse it. Please share this information to help us help others. Fat cells affected by lipohypertrophy are two to three times larger than normal . This growth causes distortion of the surrounding support tissues and can compress blood vessels. Moreover, as supporting fibers become stretched skin loses its youthful elastic nature. This increased thickening and loss of suppleness leads to the perceptible changes involving the damaged skin. Prominent visual changes take the most time to develop. These include the appearance of a mass just below the skin or an area of raised irregularity. It is important to remember that by the time a visible change in the skin occurs the negative effects, discussed in more detail below, have been occurring for quite some time. Therefore, monitoring for LH with simple visual inspection in not enough. To find lipohypertrophy at an earlier point palpation is used. Palpation simply means, “to feel.” This is the easiest and least expensive way to find areas of LH, but it also requires experience to notice the earliest signs. Unfortunately, most people and many care providers are not skilled in palpating for lipohypertrophy. Luckily, a wonderful paper was published in 2016 that outlines an examination technique to reliably detect LH . We are even more fortunate that this article was published as “Open Access,” so anyone can view and learn from the authors. In brief, the examiner should use their fingertips to feel and pinch up areas of skin in an organized pattern to slowly outline areas of thickening or increased stiffness. This should occur at every office visit. Even when skin sites appear healthy, a health care provider should inspect each area used to administer insulin to provide assurance and to hone their examination skills. Ultrasound examination can also be used to find and outline areas of lipohypertrophy. Most people are familiar with ultrasound being used to monitor a pregnancy, but ultrasound can also be used to examine numerous other body parts. Using a specialized high frequency ultrasound probe the skin and subcutaneous fat where insulin is administered can be carefully examined. On ultrasound, areas of LH appear noisy, have twisted internal structure, and are separated from normal fat . Ultrasound can also be used to show decreased blood flow within affected tissue. This decreased blood flow in a major contributor to the effects LH has on the treatment of diabetes discussed in the next section. Three ultrasound images of lipohypertrophy cause by repeated insulin injection without proper site rotation. This lesion was not appreciated on visual inspection alone. A) "Panoramic" view demonstration size of the area affected (9.5x2.6x3.9 cm). 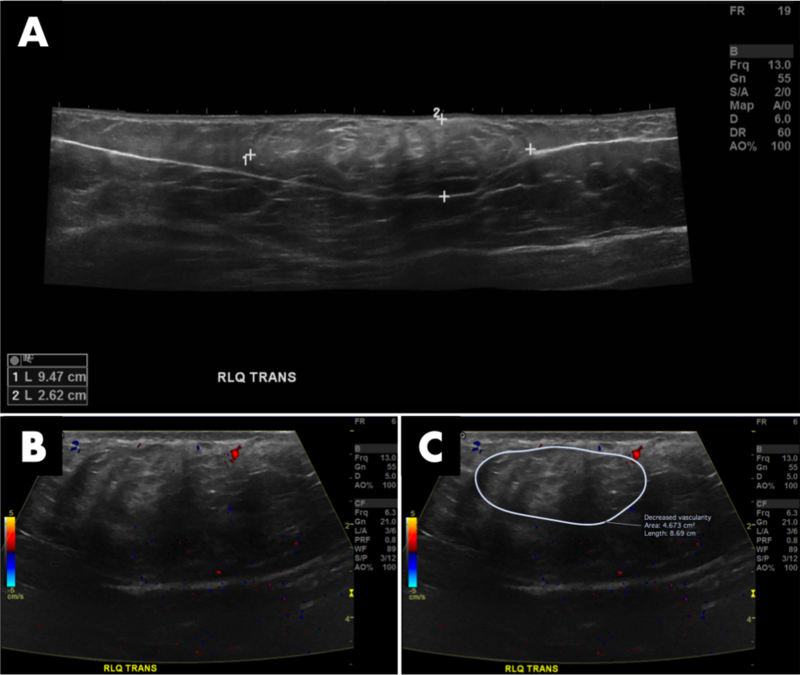 B) Doppler ultrasound image demonstrating decreases vascular flow within the region of lipohypertrophy. C) Area of LH outlined for ease of interpretation. Normal subcutaneous fat and blood vessels can be seen just outside of the affected area. Images courtesy of: J. Pohlman M.D. Note: Ultrasound examination is often unnecessary. It should only be used when the diagnosis of lipohypertrophy is questioned or if there is concern for other complications such as abscess formation. Up to 85% of individuals may be affected by lipohypertrophy after 15 years of insulin use. Exact numbers for the frequency and prevalence of LH is unknown, but one thing is for sure: it is more common than most individuals with diabetes know. One study found LH in 64% of all patients using injectable insulin . With further analysis this study showed that LH affected individuals with type 1 diabetes 72.3% of the time. Many other studies report lipohypertrophy occurring in 40-50% of individuals, and two studies specific to insulin pump users revealed an incidence of LH of approximately 25% [6,7]. These last two articles referenced, studied patient groups with a relatively short average duration of insulin pump use (3.3 years in ). This is important because the incidence of LH is known to increase with time and many children diagnosed with diabetes may require insulin injections or pump therapy for the remainder of their lives. This trend is exemplified by one study demonstrating LH in 12% of patients who have been using insulin less then 5 years, 41% of patient using insulin for 6-10 years, 77% in those using insulin for 11-15 years, and in 85% of individuals using insulin for 16-20 years . What effects does lipohypertrophy have on treatment? Lipohypertrophy causes infuriating erratic blood sugars, worsens glycemic control, and increases risk of other complications. Injecting insulin into skin sites affected by lipohypertrophy can cause erratic blood sugars. Erratic blood sugars are caused by unpredictable and delayed insulin absorption. Looking back to the ultrasound images above one may imagine how insulin may become trapped within the abnormal area. Also, the decrease vascular flow, as demonstrated by the doppler ultrasound image, slows the absorption that does occur. Beyond worsening glycemic control, there are also the psychological effects baffling swings in blood glucose cause. Every individual with diabetes has experienced the unpredictable nature of this disease. Often times there appears to be innumerable variables affecting blood glucose levels. Before anyone becomes disheartened by a series of random fluctuation they should remember to check their skin site. Recognizing skin changes, having an understanding of lipohypertrophy, and knowing the consequences of administering insulin into altered subcutaneous fat can help reduce the number of these frustrating moments. Without knowledge of this condition an individual may easily become demotivated by bewildering blood glucose trends - one of the worst situation a person with diabetes can find themselves in. Careful attention is also needed if insulin doses were adjusted while using a site of lipohypertrophy. Areas of LH often require increased basal and bolus insulin doses, increasing the risk of hypoglycemia when normal skin is subsequently used . Therefore, when switching to a new injection or infusion skin site extra caution is warranted. Never switch to a new site in the evening; an entire day should be given to make sure any new site is working as expected. What can I do to prevent or reverse lipohypertrophy? It is always best to prevent a complication before it starts. To prevent injection related skin changes sites must be rotated. Two types of rotation are important to practice. First, there is rotating within a region of skin. For example, many references recommend splitting the abdomen into 4 or 8 regions. Within each region injections or infusion set placement are rotation in an organized pattern. One common method is to rotation around an imaginary clock. Using this method an insulin pump infusion set may be placed at 12 o’clock, then 3 o’clock, then 6 o’clock, and finally at the 9 o'clock position. Assuming that each infusion set lasts for 3 days, this would cover a 12 day period and complete use of this site. Next, the second type of rotation must occur. The second type of rotation is a transition to a new region of skin. This may include all areas that the patient and their healthcare provider have determined work well. Common regions include the abdomen, thighs, top of the gluteal region, flanks, and the back of the upper arms. After completing another rotation pattern within a skin region, continue on to the next to repeat the process. Using this type of two-tier rotation strategy many weeks can pass before a specific area is re-infused with insulin. To help keep track of skin regions used for insulin injection therapy and infusion set placement we created an easy to use web based application called “inSite.” This name comes from insulin infusion site and has been designed to help give insight into users rotation patterns and skin health. We hope everyone reading this finds as much value in this simple tool as our alpha testers did. What about reversing or healing an area of lipohypertrophy? If an area is found which results in erratic blood sugars or irregular subcutaneous fat is felt, that area must be avoided. To heal, an area must not be aggravated by injections or insulin administration until all skin changes completely resolve. This may take several months to occur . This area should also be brought to the attention of a health care provider for further, personalized, guidance. Does lipohypertrophy affect the accuracy of continuous glucose monitors (CGM)? There have been few studies looking into this question. One study published in 2015 showed no difference in CGM accuracy between sensors located in tissue affected by LH and normal tissue . This study involved 29 individuals, lasted two weeks, and included the analysis of 1,547 blood glucose readings. Due to its short length, this study did not determined if using an area of LH for CGM sensor placement causes further tissue damage or prevents healing. Increased caution is advised when using areas of LH for CGM sensor placement. All sites of lipohypertrophy should be brought to the attention of a healthcare provided, even if just being used for CGM sensor placement. 1. Blanco M, Hernández MT, Strauss KW, Amaya M. Prevalence and risk factors of lipohypertrophy in insulin-injecting patients with diabetes. Diabetes Metab. 2013;39: 445–453. 2. Frid AH, Hirsch LJ, Menchior AR, Morel DR, Strauss KW. Worldwide Injection Technique Questionnaire Study: Injecting Complications and the Role of the Professional. Mayo Clin Proc. 2016;91: 1224–1230. 3. Frid AH, Kreugel G, Grassi G, Halimi S, Hicks D, Hirsch LJ, et al. New Insulin Delivery Recommendations. Mayo Clin Proc. 2016;91: 1231–1255. 4. Gentile S, Guarino G, Giancaterini A, Guida P, Strollo F, AMD-OSDI Italian Injection Technique Study Group. A suitable palpation technique allows to identify skin lipohypertrophic lesions in insulin-treated people with diabetes. Springerplus. 2016;5: 563. 5. Kapeluto J, Paty BW, Chang SD, Eddy C, Meneilly G. Criteria for the Detection of Insulin-induced Lipohypertrophy Using Ultrasonography. Canadian Journal of Diabetes. Elsevier; 2015;39: 534. 6. Pickup JC, Yemane N, Brackenridge A, Pender S. Nonmetabolic complications of continuous subcutaneous insulin infusion: a patient survey. Diabetes Technol Ther. 2014;16: 145–149. 7. Conwell LS, Pope E, Artiles AM, Mohanta A, Daneman A, Daneman D. Dermatological complications of continuous subcutaneous insulin infusion in children and adolescents. J Pediatr. 2008;152: 622–628. 8. Vardar B, Kizilci S. Incidence of lipohypertrophy in diabetic patients and a study of influencing factors. Diabetes Res Clin Pract. 2007;77: 231–236. 9. Gentile S, Strollo F, Ceriello A, AMD-OSDI Injection Technique Study Group. Lipodystrophy in Insulin-Treated Subjects and Other Injection-Site Skin Reactions: Are We Sure Everything is Clear? Diabetes Ther. 2016;7: 401–409. 10. Moran KJ, Burson R. Preventing lipohypertrophy. Home Healthc Nurse. 2014;32: 499. 11. DeSalvo DJ, Maahs DM, Messer L, Wadwa RP, Payne S, Ly TT, et al. Effect of lipohypertrophy on accuracy of continuous glucose monitoring in patients with type 1 diabetes. Diabetes Care. 2015;38: e166–7.